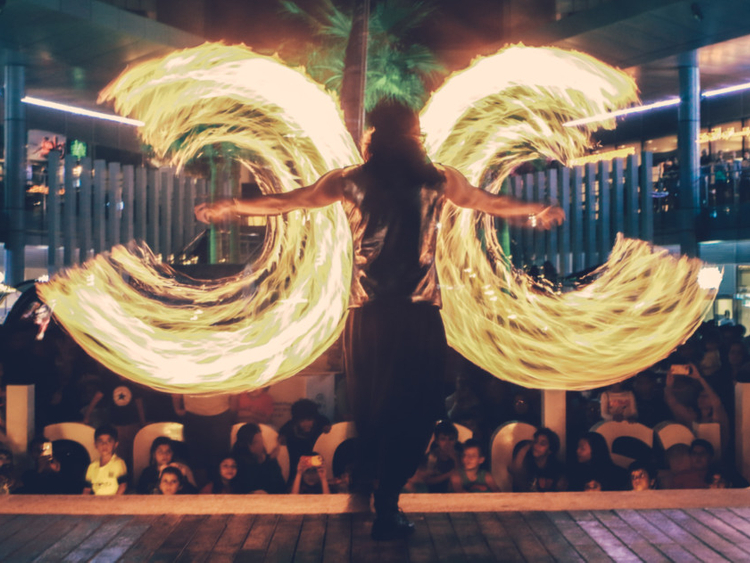 Live music, fashion pop-ups, food stands, street entertainment, market, water sports and competitions, at Al Muneera Beach Plaza, Al Raha Beach, 4-9pm. Free entry. More at alohaabudhabi.ae. Cool Working People featuring DJ Liutik and Saif and Sound, a networking and socialising industry night at Up and Below, Courtyard By Marriott, 8pm. Call 02-6982222. Mother of the Nation Festival, a festival featuring art exhibitions, live performances, beach-dining, adventure and children’s activities, at Abu Dhabi Corniche, until April 2. Daily from 4pm-midnight. Tickets Dh10 for children under 12, Dh20 for adults. More at motn.ae. Teachers offer, all teachers plus three friends or family members get a special park entry rate of Dh85 per person on bronze admission at Ferrari World Abu Dhabi. Valid until March 31. More at ferrariworldabudhabi.com. The Emirates Classic Car Festival, a showcase of classic cars at Downtown Dubai, last day. FFWD Pop-Up store, purchase spring/summer 16 collections from five selected regional designers (Army of 1, Bedouin, Mira Hayek, Orkalia and Zena Presley), at Galeries Lafayette, The Dubai Mall, until April 15. Spirit of Liwa, a group exhibition comprising 14 international artists and their contemporary expression of figurative art, at Gallery 76, DIFC, until Tuesday. Call 04-3444398. Sing for your supper every Sunday, sing your favourite song, get five thumbs up from other guests and your main course is free, at Hard Rock Cafe, from 8.30pm. Installation: Artroom’s Collective Loft featuring artworks and handmade design pieces by 23 artists and designers, at Zumtobel Lighting Warehouse, 6A Street, Al Quoz, until March 31. More at afdubai.org. Cinema Sunday, screening of Despicable Me at Gaucho, DIFC, 7.30pm. Dh100, includes snacks and soft beverages. Easter roast lunch and egg hunt from noon. Call 04-4227898. Jazz Sessions with Chapter 3, playing jazz, blues and swing, at Sass Cafe, DIFC. Call 04-3527722. Holi festival menu, at Naya, Jumeirah Beach Hotel, until March 31. Call 04-4323232. Apesanteur, a series of levitating mechanical art by French artist Quentin Carnaille, at M.A.D Gallery, Alserkal Avenue, 10am-7pm, Saturday to Thursday, until May 14. More at madgallery.ae. Metropolis Delhi Interpreted, an exhibition by Gallery Ragini from India, at Dubai Marriott Harbour Hotel & Suites lobby, until April 7. Rhythm & Verses, Persian Calligraphy from the Islamic Arts Museum Malaysia includes Quranic verses, spiritual sayings, poems and official declarations as composed by the most famous Persian calligraphers of all time. At Sharjah Museum of Islamic Civilization, until June 18. More at sharjahmuseums.ae. Alice in Wonderland themed Easter at P&C by Sergi Arola, Shangri-La Hotel, Qaryat Al Beri. Call 02-5098555. Easter at Kenza, Ramada Downtown, 1-4pm. Dh160 per person, 50 per cent off for children aged 6 and 12. Call 04-3307330. Easter-inspired set-menu at Ruth Chris Steak House. Call 04-4549538. Easter terrace brunch at Jean-Georges, 12-4pm. Call 04-3436118. Easter sharing set-menu at Fume, Pier 7. Call 04-4215669. Eggstravagant brunch at Movenpick Hotel Ibn Battuta Gate Dubai. Call 04-4445613. Easter on a Budget at Lemon Pepper, Radisson Blu Downtown, Dh99 for brunch, Dh119 with pool access. Call 055-1089934. Eggscape brunch at Al Bahar, Coral Beach Resort, 12-4pm. Dh99. Call 06-5229999.